Losing never feels good but better to get it over with prior to the state tournament and get that monkey off the back. At least that is the hope for the West Elk Wolverines girls’ U19 hockey team. After going the entire season undefeated, the Wolverines lost and tied two of their final four games. Nevertheless, they finished the regular season at the top of the league standings and head into the post-season the number one seed. 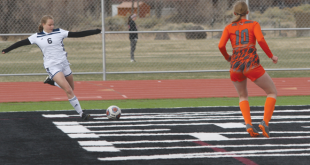 They started their final weekend of play with two games against Summit on Saturday, February 18 and it became immediately obvious that shooting would be the Wolverines’ struggle throughout the weekend. While the Wolverines outshot Summit 32-8 and dominated play for most of the game, they still only managed to eke out a 3-2 win in the first game. Bryar Robbins opened the scoring in the first game, taking a pass from Izzie Dethloff and roofing the puck in the sixth minute. Summit responded three minutes later to tie the game but when a solid forecheck by the Wolverines sent Kendl Santelli loose with the puck, Santelli shot and followed on her own rebound to score for a 2-1 Wolverines lead by the close of the first period. The two teams played scoreless hockey through the second period but the Wolverines added an insurance goal seven minutes into the third period as Jansen Lucas scored off an assist from Hailey Shrieves. Summit pulled their goalie and connected in the final 10 seconds but Lucas’ goal was enough, as the Wolverines finished with the 3-2 win. The two teams squared off again later that day and it looked as if shooting woes would continue to plague the Wolverines. After two periods of play the Wolverines were up just 1-0 on a goal from Lucas, despite massively outshooting Summit. “We just looked at the girls and said, this game is way too close,” says Santelli. The girls took it to heart as they finished the game scoring four goals over three minutes in the third period. Sophie Hall started it off seven minutes into the period, Kathryn Guerrieri tacked on the Wolverines’ third goal a minute later, Dethloff netted one to follow and Lauren Shrieves capped the rally with a goal to finish off the 5-0 win. “We had five different scorers that game, and eight goals over two games with seven different scorers, so we like that,” says Santelli. The Wolverines had a day off to regroup before returning to the ice on Sunday, February 19 to face Telluride for the final two games of the regular season. 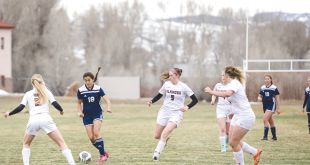 While on paper the Wolverines were the favorite to win both, Telluride had just won their previous two games to move into fifth place and were surging. “I’d been watching Telluride the last month and they were playing just better and better,” says Santelli. Telluride came out hot off their last two wins while the Wolverines fell back into their scoring slump. Telluride scored in the first and third period while the Wolverines were held scoreless by poor shooting, a little bit of lethargy and Telluride’s solid goaltender. Despite outshooting Telluride 38-17, those aforementioned three ingredients led to the Wolverines’ demise, as they lost their first game of the season 2-0. Santelli laid out a plan for his team prior to the second game against Telluride. The game got off to a rocky start as the Wolverines found themselves on a penalty kill once again one minute into the game. “Once again we were in the penalty box too much,” says Santelli. Telluride picked up a penalty as well, leaving the two teams to play 4v4 hockey for a minute but the Wolverines struggled to take advantage of the open ice. The two teams finished the first period notched in a scoreless tie but the Wolverines finally cracked the seal three minutes in the second period during a power play. Hailey Shrieves took a breakout pass from Dethloff and proceeded to skate past Telluride’s defense to fire a shot at the upper corner. Telluride’s goalie got a glove on the puck but it trickled out and into the net for a 1-0 Wolverines lead. The hope was the goal would lead to more but Telluride responded a minute later and the two teams were back in the throes of a battle. The Wolverines killed off another penalty and proceeded to gain control of puck possession but Telluride’s defense and their goalie were spot on to hold off the Wolverine attack. Telluride surged toward the end of the second period but Anika Anderson came up with a couple big saves to keep the game locked in a 1-1 tie. The Wolverines had one last chance, finishing the game with a power play but Telluride held them off and the two teams finished with a 1-1 tie. The Wolverines head to the post-season this weekend starting on Friday, February 24. Unfortunately, they may be missing their players they have been using from the U14 team as the U14 Wolverines are headed to the post-season as well.